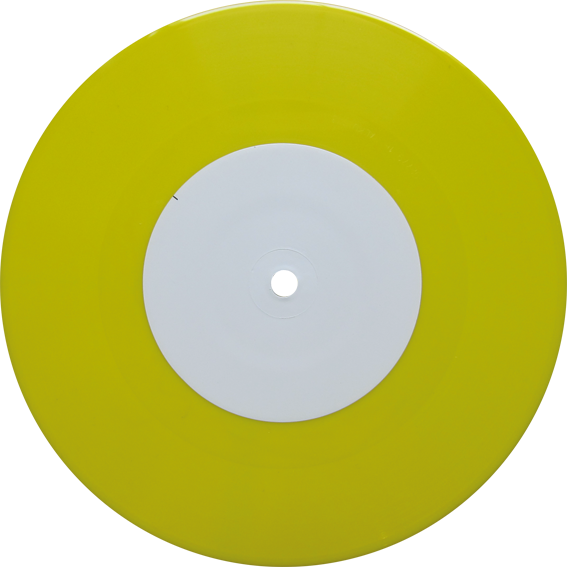 Limited edition yellow vinyl 7" in clear polyvinyl chloride sleeve. Two pieces for hand-held agitated unfilled extended geometric figures made of synthetic ersatz substance with straight parallel sides and a circular round section at each end. Presented as recorded in real-time without any edits, overdubs or effects added. This recording contains unprocessed acoustic sounds only. Headphone listening recommended. Play very loud, at 45 RPM!!! Available in small hole only. Recorded using binaural microphones on a found, carved dummy head at the Diener 40 recording studio in Zürich on 27th june 2011. 100% acoustic rave action. Recording supervised by the composer. This record should be played with a stereo cartridge. For further info on Dave, see his own site. Vogt, Stefan and Carey, David (1998) Toward a microanalysis of imitative actions. Behavioral and Brain Sciences, 21 (5). pp. 705-706. ISSN 0140-525X.